What is the role of angels in heaven? What is the role of angels on earth? What is their job description? The Greek word for angels is “aggelos” and in English is “engel.“ Either way, the name angel means “messenger of God.” That is one of the chief duties on angels. Remember the angel that was sent to Daniel. This was “Michael, one of the chief princes” which means that He was of a high rank of the angels (Daniel 10:13). Chief could be considered a general but we must remember that all angels are under the direct reign and sovereignty of God. 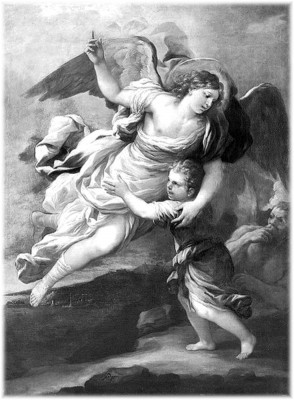 Michael is also called an “archangel Michael” (Jude 1:9). Michael must be in charge of at least some angels, even though still under God overall, because when “there was war in heaven. Michael and his angels fought against the dragon, and the dragon and his angels fought back” (Revelation 12:7). Note that this verse said, his angels. These “messengers” of God have many duties in heaven and on earth. Angels are not the chubby little cherubs that appear in most paintings and they do not all have wings. These are powerful spirit beings and they have specific jobs to do. They are messengers, they are dispatched to aid humans in need for times of emergency or for protection, and some are specifically created to worship God in heaven 24 hours a day. What Do Angels do on Earth? Angels are given to us, as directed by God, to protect and defend His chosen ones. Michael told Daniel that he was “the great prince who protects your people” (Daniel 12:1). So we see that angels are messengers and also are protectors of God’s people. God dispatched angels to Christ after His temptation in the Wilderness and “attended him” (Matthew 4:11). In the Garden of Gethsemane, just before Calvary, He prayed for God to remove this cup if possible and was in excruciating agony when (Luke 22:43). We have angels around us as the author of Hebrews wrote, “Are not all angels ministering spirits sent to serve those who will inherit salvation” (Hebrews 1:14)? Those who will inherit salvation are clearly the believers. Many of us may have been visited by angels and not even known it as the writer of Hebrews says to “not forget to entertain strangers, for by so doing some have unwittingly entertained angels” (Hebrews 13:2). These “messengers” of God have many duties in heaven and on earth. Angels are worshipping God every second, of every minute, of every day and night. They worship Jesus (Hebrews 1:6) and they surround God‘s throne as it says in Revelation 4:8, “Each of the four living creatures had six wings and was covered with eyes all around, even under its wings. Day and night they never stop saying: “‘Holy, holy, holy is the Lord God Almighty,’ who was, and is, and is to come.” The angels declare God’s glory and some were created just for this reason. At Jesus’ second coming, “He will send his angels with a loud trumpet call, and they will gather his elect from the four winds, from one end of the heavens to the other” (Matthew24:31). But this duty of the holy angels will be foreboding for those who have not put their trust in Christ because “This is how it will be at the end of the age. The angels will come and separate the wicked from the righteous and throw them into the blazing furnace, where there will be weeping and gnashing of teeth” (Matthew 13:49-50). Decide today whether you are going to join with the angels in worshipping Christ in the Kingdom of Heaven or have them caste you into the lake of fire at Jesus’ return. For those who have trusted Christ, they will partake in the great joy of eternal bliss of the fellowship of the saints before God. For those who refuse to repent, confess, and reject Jesus as Lord, King, and Savior the only thing that they can expect is the wrath of God. For “Anyone who rejected the Law of Moses died without mercy on the testimony of two or three witnesses. How much more severely do you think someone deserves to be punished who has trampled the Son of God underfoot, who has treated as an unholy thing the blood of the covenant that sanctified them, and who has insulted the Spirit of grace? For we know him who said, “It is mine to avenge; I will repay,” and again, “The Lord will judge his people.” It is a dreadful thing to fall into the hands of the living God” (Hebrews 10:28-31). Indeed it will be a terrible day for those who put their trust in their own goodness and think they’ve been a good person…good enough to go to heaven. No, Jesus gives us a stern warning in Matthew 7:21-23, “Not everyone who says to Me, ‘Lord, Lord,’ shall enter the kingdom of heaven, but he who does the will of My Father in heaven. Many will say to Me in that day, ‘Lord, Lord, have we not prophesied in Your name, cast out demons in Your name, and done many wonders in Your name?’ And then I will declare to them, ‘I never knew you; depart from Me, you who practice lawlessness!’” Jesus does not say that He doesn’t know them, He says that He never knew them. They will then fall into the hands of the living God. My prayer for all who read this is that they will believe in the only name given to us by which we must be and can be saved, and that is Jesus Christ (Acts 4:12). Humble yourselves before Him today, while it is still called today (2 Corinthians 6:2). Resource – New International Version Bible, The Holy Bible, New International Version®, NIV® Copyright© 1973, 1978, 1984, 2011 by Biblca, Inc.™ Used by permission. All rights reserved worldwide. YouTube video “Angels Watching Over Me” by Amy Grant. This is the 2nd time I’ve read this article about angels, Pastor Jack. Reminds me about the one time I was having my hair cut by a BARBER (couldn’t afford the beauty salons at the time.) Was in my early 20’s, long before I seriously read the Bible. The Barber & I started talking about Christianity, he asked if I believed in Jesus. Of course I replied, “Oh yes! Jesus is my best friend!” He chuckled, continuing cutting my hair. Then I asked him about angels, did they really exist? He replied, “Oh yes. Read your bible, you’ll see.” Continued to argue that I haven’t found any references to angels in the Bible. (That showed my ignorance~! LOL) With a beautiful smile on his face, he said to keep reading Bible, I’d find it. Which I did….when I read your article above here the FIRST time, Pastor Jack! God bless you and your family, oodles, Pastor Jack! Thanks so much Patty. You are more kind to me than I deserve. I too don’t comprehend the Holy Trinity but that’s what He is God and we are not. It is so hard to have a finite mind like mine be able to wrap around an infinite God. I am so overjoyed by your encouragement and the humility you show is a rare thing these days…even among Christians. May God richly bless you my good friend. Thanks Jack, I have learned so much here . Michelle…I thank you so much for your kind remarks. Some day we will see these spirit beings but it is comforting to know they are assigned and on the job for the children of God. This was a great article Jack. The angels are amazing creatures and they really aren’t talked about enough in truthful ways. I always learn from your articles and I am grateful for you brother. God bless! Thank you Derek my brother. Back at ya on that about learning from you. I believe that iron sharpens iron and since rust never sleeps, I need it too! Hi Jack. I see no conflict of interest however if they are ads that condone or approve of sin, then that’s a different matter. I don’t know that the user has any choice over any ad on their Youtube videos, therefore I have chose to not put ads on mine because they are Christian messages. I did try once but was too dissapointed to allow them because some of the ads were contrary to my message. Make sense friend? Thanks for the question and may God richly bless you.